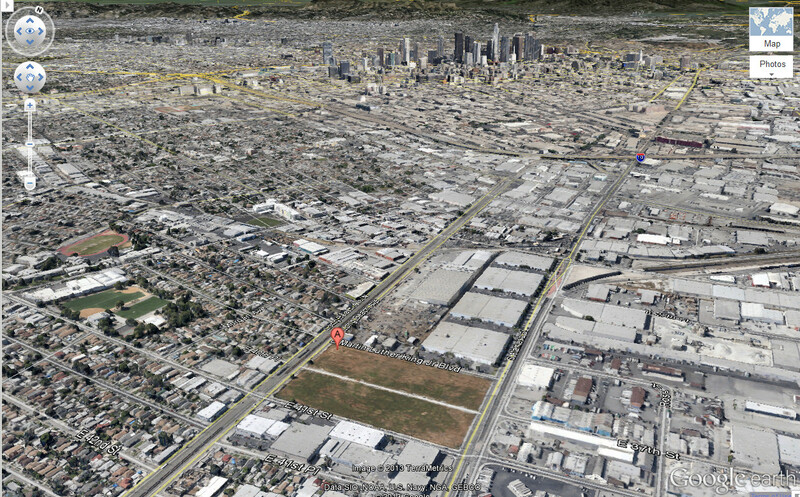 In the last blog , "LA Planning Commission Must Heed South LA Community", we covered the long contested experience of the site previously known as the South Central Farm, prior home of the South Central Farmers and located at 41st and Alameda (See map below). In part II we are going to cover some of the direct impacts on the community from this proposed development that will erase the largest contiguous piece of land in South Los Angeles. This in itself is a sad statement on development in the City of Los Angeles where 14 acres can be considered large undeveloped land. (3) Appropriate consideration of numerous unmitigated impacts in light of environmental justice principles and the fact that this development proposal is a matter of intense public interest and controversy. The ways people cope with life through their economy, social systems, and cultural values. The ways people use the natural environment, for subsistence, recreation, spiritual activities, cultural activities, and so forth. The ways people use the built environment, for shelter, making livelihoods, industry, worship, recreation, gathering together, etc. The ways communities are organized, and held together by their social and cultural institutions and beliefs. Ways of life that communities value as expressions of their identity. Art, music, dance, language arts, crafts, and other expressive aspects of culture. A group's values and beliefs about appropriate ways to live, family and extra-family relationships, status relationships, means of expression, and other expressions of community. The esthetic and cultural character of a community or neighborhood -- its ambience. In the end Dr. Peña highlights how this development will impact the communities quality of life, "previous research illustrates how biophysical disturbances (such as disruptions caused by industrial, warehousing, military installations, remediation sites, power plants, landfills, logging, mining, subdividing, and reservoir and road construction) can negatively impact established cultural and heritage landscapes and disrupt social networks. Such physical transformations of place can have long-term displacement effects and undermine both collective economic and interpersonal relationships in local communities." I call on the City of Los Angeles to :(1) Comply with CEQA standards by completing a thorough and triangulated interdisciplinary study of the cumulative, compounding, and cascading effects of disproportionate adverse impacts that will attenuate pre-existing community health problems and (2) Abide by the Principles of Environmental Justice embraced by California as part of implementation of public policy and limits alternatives that might enhance the prospects for more just and sustainable economic development alternatives in a community that is exposed but not confused. We are disappointed with the level of documentation provided for this project to support the Mitigated Negative Declaration ("MND") and Initial Study ("IS"). Given the dearth of information about what this project actually entails, we recommend redoing the environmental analysis. As NRDC has articulated in the past, a project of this scope and size demands and Environmental Impact Report ("EIR") to fully comply with the law and allow for informed disclosure of the true impacts. Even though the information in the MND and IS is totally inadequate to allow proper public input, NRDC has reviewed excerpts from the September 26, 2012 Traffic Impact Analysis ("TIA") analysis. It is unclear whether this is the traffic analysis for the revised project or a prior iteration of the project. Notably, any reliance on the estimates from this traffic analysis are flawed. It appears that there has been no analysis of the air quality emissions from the operation of this facility. There are several models that can estimate the emissions from this type of project, including CalEEMod. Given the low significance thresholds in the region, this project will definitely have a significant impact on air quality unless mitigation is adopted. In fact, SCAQMD states that warehouses greater than 100,000 square feet are considered large. SCAQMD Guidance, Section 3. This project entails a development approximately five times the size what the agency responsible for air quality considers large. Accordingly, there needs to be more information provided about the unrealistic estimates that there will be no operational impacts. The South LA community is highly concerned over the lack of regulatory oversight and analysis of the soil contamination at the proposed site. The developer applicant has turned in an additional document, a soil vapor study on the site @ 41st and Alameda dated in 2011. The community has concerns on the third paragraph under "BACKGROUND" in the SCS report dated March 2011. This paragraph says, ""At least five phases of environmental soil investigation had been conducted on the Property with testing for total petroleum hydrocarbons (TPH), volatile organic compounds (VOCs), semi-volatile organic compounds (SVOCs), metals, hexavalent chromium, organochlorine pesticides, polychlorinated biphenyls (PCBs) and herbicides. No significant concentrations were detected for most of these chemicals of potential concern." "No significant concentrations were detected for most of these chemicals of potential concern" (emphasis added). Use of the word "most" implies that significant concentrations of SOME chemicals WERE detected. The quote from the report conspicuously does NOT state "No significant concentrations were detected for ANY of these chemicals..." Thus it is logical to deduce that some significant concentrations were detected. Seems to me that more investigation and analysis is called for, to identify which chemicals were detected in significant concentrations, or if this is just an intentionally cautious phrase in the original report. The community requests that the City Planning Department verify whether or not the prior record indicates the presence of significant concentrations of ANY of these chemicals of concern on the site. Is the SCS report on H & P's sampling considered the "5th environmental soil investigation"? If not, how do you characterize the sampling and report? List all 5 environmental soil investigations (and phases) that took place at the 41st and Alameda site over the decades. Who conducted the investigations, at whose behest, and on what dates? Will any or all of these documents be included in the Planning Dept. paperwork for the proposed PIMA development on this site? Why, or why not? Are any of these environmental soil investigations of the 41st and Alameda site in the record of the proceedings regarding the Poetry, Impact, Miss Me, and Active (PIMA) development? Why, or why not? Did Missme.com, Inc. advise or clearly state that the soil sampling was to look only at Volatile Organic Compounds, rather than the 7 other kinds of pollutants which were mentioned in that bolded sentence near the top of this email comment -- a list of 7 which included hexavalent chromium? In Part III we will cover the details of the hazardous substances on the site and important community questions.